This was Cassini’s fourth targeted flyby of Dione and the spacecraft had a close approach altitude of 321 miles (516 kilometers) from Dione’s surface. The bright rings of Saturn can be seen at left, in the background of the image. North on Dione is up and rotated 44 degrees to the left. The image was taken in visible light with the Cassini spacecraft narrow-angle camera on June 16, 2015. The view was acquired at a distance of approximately 48,000 miles (77,000 kilometers) from Dione and at a sun-Dione-spacecraft, or phase, angle of 128 degrees. Image scale is 1,519 feet (463 meters) per pixel. 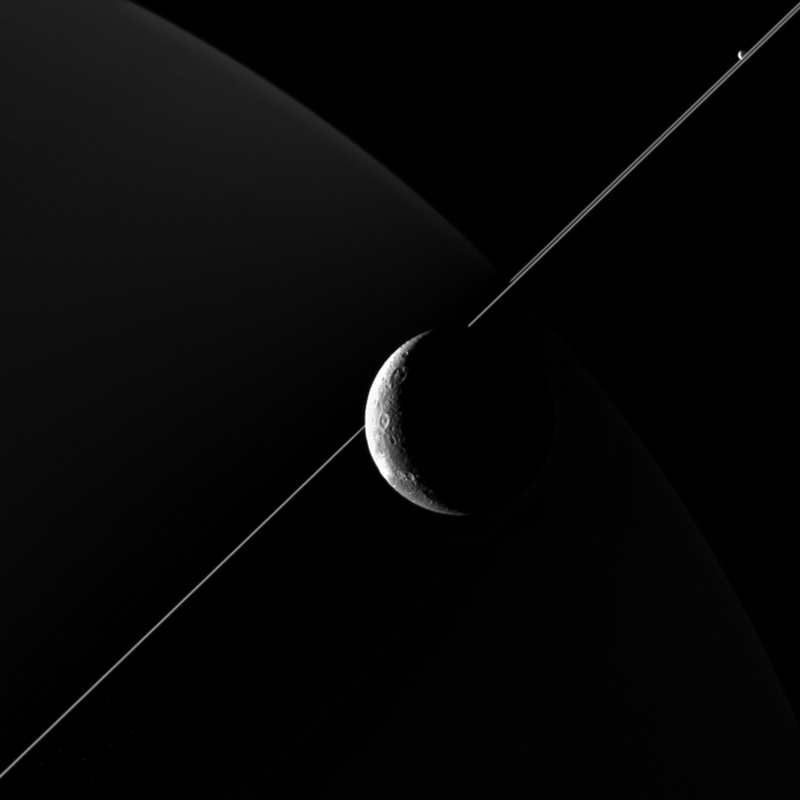 NASA’s Cassini Spacecraft reveals it latest flyby images of Saturn’s moon Dione. The rugged landscape of Saturn’s fracture-faced moon Dione is revealed in images sent back by NASA’s Cassini spacecraft from its latest flyby. 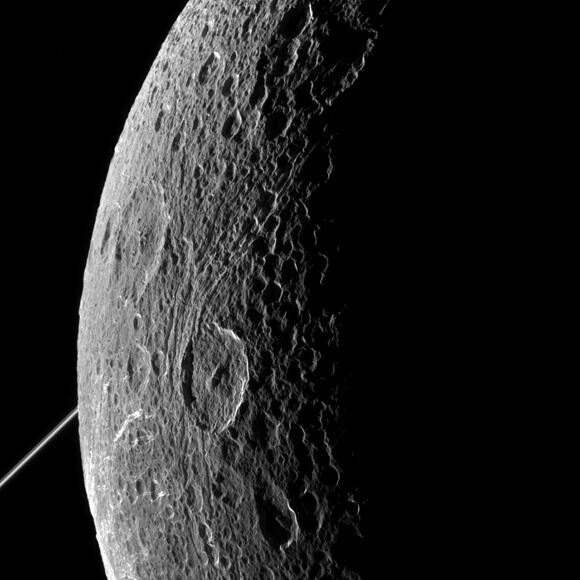 Cassini buzzed past Dione on June 16, coming within 321 miles (516 kilometers) of the moon’s surface. The view was acquired at a distance of approximately 48,000 miles (77,000 kilometers) from Dione and at a sun-Dione-spacecraft, or phase, angle of 128 degrees. Image scale is 3 miles (5 kilometers) per pixel. On August 17, the spacecraft will make its final flyby of Dione, diving to within 295 miles (474 kilometers) of the surface. The final Dione encounter will be Cassini’s second-closest brush with the icy moon. A December 2011 flyby saw the spacecraft reach an altitude of just 60 miles (100 kilometers) above Dione. The Cassini-Huygens mission is a cooperative project of NASA, ESA (European Space Agency) and the Italian Space Agency. NASA’s Jet Propulsion Laboratory in Pasadena, California, manages the mission for the agency’s Science Mission Directorate in Washington. JPL is a division of the California Institute of Technology in Pasadena. The Cassini imaging operations center is based at the Space Science Institute in Boulder, Colorado. Be the first to comment on "New Cassini Images of Saturn’s Moon Dione"